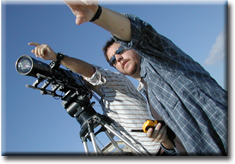 Over the years, Thomas Mumme has been determined to learn all aspects of the Motion Picture and Television field and has worked professionally as a Producer, Director, DP, Camera Op, First AD, Camera Assistant/Utility, Grip, Gaffer, Audio Tech, Editor and a whole lot more. He has strived to become as well-rounded in Film & Video Production as he possibly can be. He has been a freelancer for the past 19 years and has racked up credits on feature films; including RACE TO SPACE, THE DEVIL’S OWN and MEN IN BLACK; television shows and companies including AMC, CBS, MTV, VH-1, ESPN, ET, Oprah, Emeril, Woodstock ‘99, Court TV, Real TV, & M. Night Shyamalan’s Signs of Fear for ABC. In 1999, Mumme won an Emmy for his work on The John Glenn Launch. Most recently, he has been working on reality TV shows such as Comic Book Men, Survivor, Celebrity Apprentice, Ghost Hunters International, Expedition Impossible, Tabatha’s Salon Takeover, Kitchen Nightmares, MTV’s Exiled, MSNBC’s Lockup & SPIKE’s Pros Vs. Joes, just to name a few. In the Independent Film world, Mumme has served as Cinematographer on several award-winning films, including the feature DELAYED for Torino Pictures, and shorts BLiNK by Looking Glass Pictures & DUDLEY AND THE TOY KEEPERS CHEST (Poem Pictures) for which he won a Special Recognition in Cinematography from the Melbourne Independent Filmmaker’s Festival.